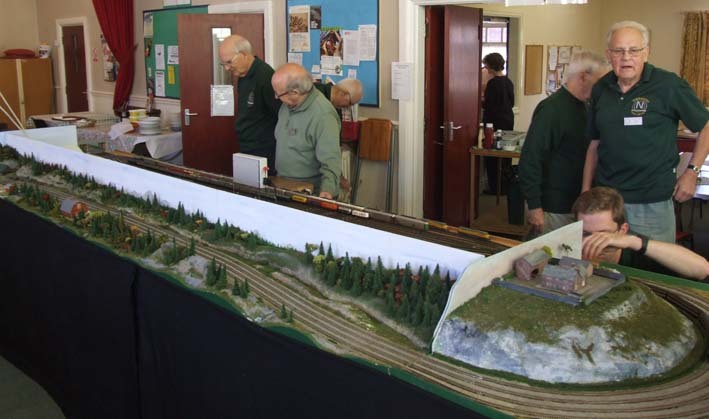 'Guy's Cuttings' was built as a scenic group layout which could be setup at group meetings, and also be taken to exhibitions. It consists of three 4ft long x 14" wide boards, with a 4-track mainline running through wooded scenery. This fits with a 12 foot long fiddle yard with 10 storage sidings, plus 2 endboards. It can be set up to run under DC power, or DCC power or a combination of both (2tracks each). In total the layout is 17 ft long x 4ft wide, and the 2 endboards have scenic boards which are removable to allow for ease of transport. Trackwork on the scenic boards is Peco Code 55. Trackwork in the fiddle yard is all Peco Code 80 (helps with putting stock on!) and points are all electrified using Peco point motors and accessory switches which power the frogs to give reliable running. This, in the main, works well but if we were rebuilding, then large radius points would be used rather than medium radius. Point control is by probe and stud on a centrally mounted panel, with a detachable panel with lights to indicate which way the points are set. DC controllers for each track have been built by a group member. All the electrics for the layout are fed into the fiddle yard; and power is taken round the layout from board to board by means of phono plugs and sockets .